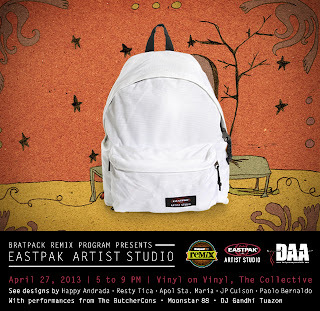 EASTPAK's Artist Studio event is happening on April 27, 5pm to 9pm at Vinyl on Vinyl, The Collective! See the designs of featured artists Happy Andrada, Resty Tica, Apol Sta Maria, JP Cuison and Paolo Bernaldo. Live performances by The ButcherCons, Moonstar 88 and DJ Gandhi Tuazon. 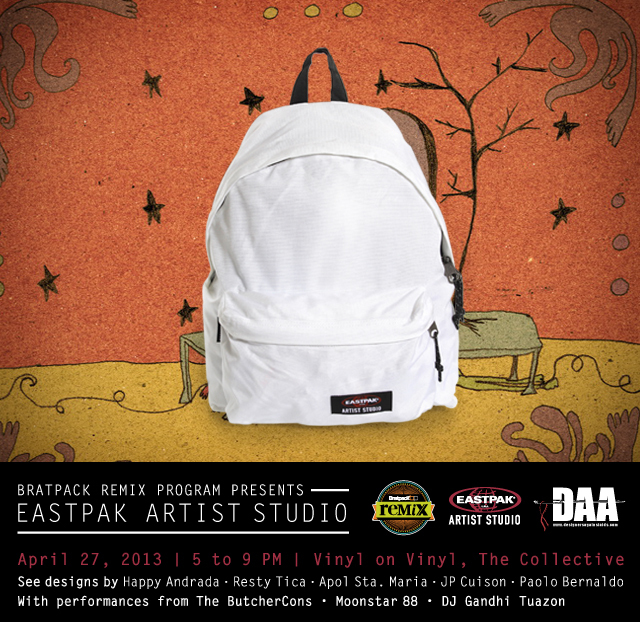 Eastpak and Bratpack Remix presents this year’s EASTPAK Artist Studio. As a heritage brand, Eastpak is revered by individuals across varying interests and pursuits. With its dynamic range of models and styles, the brand adheres to different tastes. In particular, EASTPAK is close to the hearts of the alternative communities – supporting the likes of creative and innovative people in various industries. 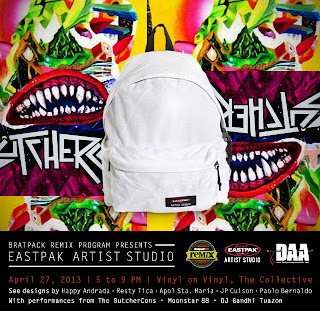 It is for this reason that the brand came up with the EASTPAK Artist Studio, a project that involves converting blank EASTPAK backpacks (iconic Padded Pak’r bag) into one-of-a-kind masterpieces by artists from around the globe. The proceeds of the project go to a charity organization called Designers Against AIDS. 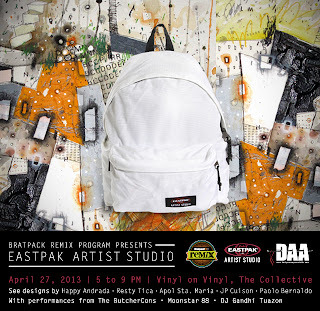 The past editions saw over 130 artists including graphic designers, product designers, DJs, and even chefs to design over 200 unique Eastpak backpacks. For the third time around, the creative platform of Bratpack that recognizes and supports local artists, known as Bratpack Remix, joined Eastpak to launch this year’s EASTPAK Artist Studio through an event held last April 27 at Vinyl on Vinyl at the Collective. In attendance to celebrate the collaborative project were hip media folks, celebrities, and members of the art scene. 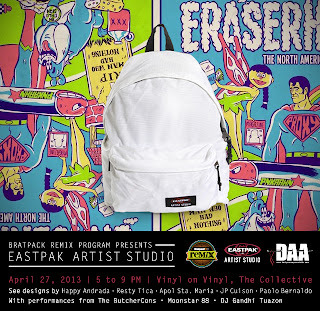 The project aims to gather the best and most prolific artists in our land to represent the country and join EASTPAK’s roster of exceptional artists for a meaningful cause. This year, five local artists were tapped by EASTPAK and Bratpack Remix - chosen to promote creative freedom and social awareness. In addition, the project also serves as a great platform to provide exposure to some of the Philippines’ most outstanding artists – propelling them to international acclaim. This year’s handpicked artists include a dynamic mix, featuring mavericks from different realms of the arts. Such is Paulo Bernaldo, who has earned recognition as the bassist of Moonstar 88 and the Butcherons. Aside from his musical inclination, Bernaldo is also an award-winning music video director for both local and foreign artists such as Kamikazee, Parokya ni Edgar, David Archuleta, and more. To further elevate his aptitude for the arts, he is also a graphic and tattoo artist. Representing the local fashion and art scene is Happy Andrada, co-owner of F*Art Fashion and a winner in a slew of design competitions here and abroad, including awards from the Miami International Fashion Week, International Emerging Designer of 2012, Swatch Watch design contest, and the Inspiring Young Filipino Entrepreneur Award by Go Negosyo 2010. Not new to representing the country abroad, Andrada brings pride for the country in international fashion events and art conventions. Meanwhile, Resty Tica’s edge lies in his impressive art works. As a print graphic artist and award-winning painter, he is known for his abstract expressionist imagery driven by pop art sensibilities. Tica has participated in numerous group exhibitions, as well as award recognitions such as the Grand Prize for PLDT-DPC Telephone Directory cover art completion, the Artist of the Year Award of the TUP Fine Arts Gawad Pagkilala sa Sining, and more. He is also a graphic artist for network giant, ABS-CBN. If not busy producing ideas for advertising, John Paul “Apol” Sta. Maria can be caught breathing life to characters in his comic books and art works. Aside from being a notable visual creator for the corporate industry, Sta. Maria is a well-loved in the art scene for his uncanny pieces that invokes humor and curiosity in the mind of the observer. An exceptional trendsetter in the practice of graphic arts, JP Cuison is highly-recognized in the Philippine advertising scene and is a two-time representative to the Cannes Young Lions International Advertising Festival. With a knack for infusing the old with the new, Cuison’s taste has led him to be commissioned by heavy-weight brands like Puma, Asia Brewery, Manila Beer, Bench clothing, as well as concert posters by local and foreign musical acts such as Rico Blanco, Razorback, Mr. Big, Addison Groove, and Lymbic System. 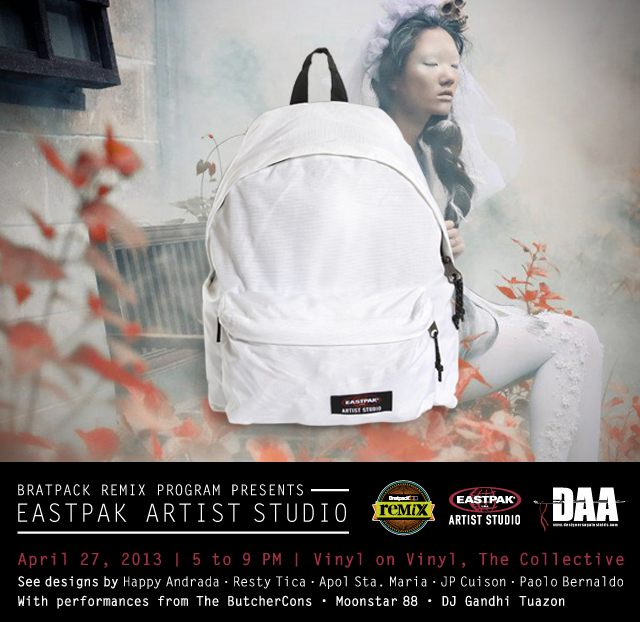 EASTPAK and Bratpack Remix truly believe in the significance of creative expression and what its power shape and redefine the consciousness of the society. Through the EASTPAK Artist Studio, both brands get to support and nurture local artists in the country as well as contribute in a meaningful cause.